It is safe to say that orange and green have dominated this year's summer shades and rightly so. There has been an abundance of these two particular colours wherever you go. Many of the fashion houses whether designer or high street have incorporated an array of these colours into their spring/summer '13 collection so much so that it is near impossible to ignore or avoid and I for one I'm not complaining. I am loving it especially since green is my favourite colour out of the colour spectrum. These lovely bright bold shades really do bring to life an outfit and they are such fun colours to play around with. 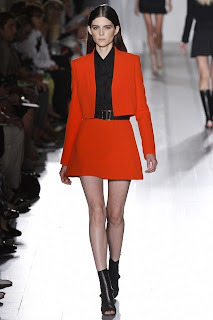 Victoria Beckham alongside many of the other designers such as Versace drew heavily on orange throughout their collection. It was the dominant colour in her 2013 spring/summer collection. 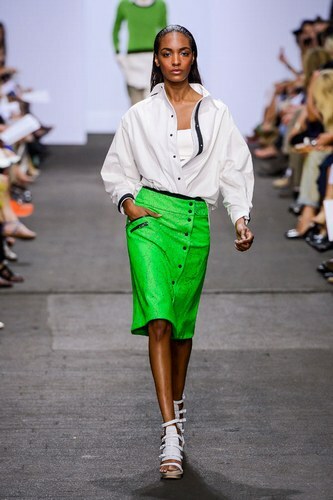 Rag and Bone for the most part focused on one of the other popular summer colours for 2013, green, it was the standout colour from their 2013 spring/summer collection. The people's favourite Zara are always quick to emulate the latest trends off the catwalks. It is therefore no surprise or by chance that when they released their popular mini shopper handbag they had them in the staple colours black and white as well as in 2013 summer colours favourite tangerine orange and emerald green. The next time you are out and about and wandering why these colours seem to very where in the shops, just know it is not by chance. The high street draws heavy influences from the cat walks and it is quite simply the high street's attempt to sell to you the latest seasonal trends and colours in high fashion without the hefty price tag. Is this the new 'it' bag?